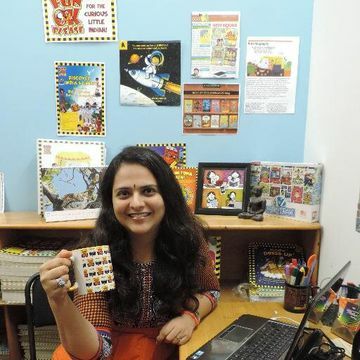 Preeti Vyas is the CFO (Chief Fun Officer) and founder of FunOKPlease Publishing India (2011), a publishing company that creates books for the curious little Indian. The company focuses on creating original contemporary Indian content for children and its catalogue of 14 books include popular titles such as Toto the Auto, Your Turn Now and 366 words in Mumbai. 9 of their titles have received awards or been part of a bestseller or curated list like ’50 Best books for Indian children”. They have also released ipad apps and board games based on their books. Preeti spent most of her childhood reading books and most of her adult life reading to children along with buying, selling and publishing books for children! Through her 19 year long career in the retail, publishing and content industries in India and Australia she has worked in a variety of roles at organisation such as ToysRUs, Sony Music, Crossword, Future Group and also ran an independent bookshop called Kidztown in Mumbai. She has also been actively involved in the marketing and editing of the Shiva Trilogy series of bestsellers written by her husband Amish Tripathi. Preeti lives in Mumbai with husband Amish and her 5 year old dinosaur expert son Neel. Meet Preeti at the SHEROES Summit Mumbai on 9th December. Balance, because you are worth it!